UPDATE 2015-08-30: I have found out that many of my pictures have been blurry ever since I tore this thing apart. I don't know why yet, but it probably is a result of my spinning the lug down a bit on the focus motor. I don't yet know how to enter the camera's service mode in the hopes of getting more information. Not sure what to do next. Please consider yourself warned. 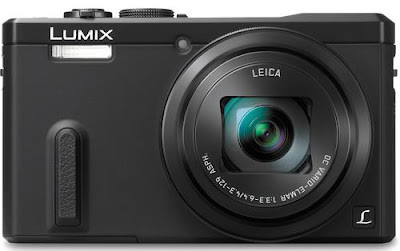 The Panasonic DMC-ZS40 (TZ60 in Europe) is a pretty awesome camera: compact, user friendly, long zoom, great image stabilization, and excellent image quality. I've been really impressed with it since My Lovely Wife and I bought it back in the spring of 2014. That's not good. Not good at all. Especially since it went off warranty around four months ago. Looking around the Net, this seems to be a pretty common problem with Panasonic. Fortunately, a few people have had the gumption to tear these things down. This blog post is great. Here is a fantastic YouTube video on disassembling the camera, and here is another on cleaning the lens assembly. All great information. All for cameras much older than the ZS40. OK, I thought. There must be a service manual out for the ZS40. The closest I could find was this one for the earlier model, the ZS30. Unfortunately, I could not find anything for the ZS40 that I wouldn't have to shell out for. And I wasn't in the mood for shelling out. I know my way around inside a computer. How hard could tearing apart a compact digital camera be? As it turns out, pretty damn hard. Digital cameras are at a completely different level of complexity and integration compared to a PC. The five hours I spent in the guts of this thing trying to restore it back to life were kinda terrifying. But I went into it pretty blind, and I made a few mistakes along the way. It would have been a lot better had I had a guide to follow like the one I am writing for you now. Take on the following procedure at your own risk. If you do take it on, read it through not once but twice, to get an idea of what you are getting yourself in to. Also read the blog and watch the videos I've linked above. a very small Japanese Industrial Standard (JIS) screwdriver. I didn't have one so I had to use a Philips 00 screwdriver instead. Read this to see how they are different, and beware that the risk of this repair goes up if you are like me and don't have the right screwdriver. a flashlight for shedding some extra light on the subject, especially if your eyes are as crappy as mine. A magnifier wouldn't hurt either. a bible, prayer book, or something like that. OK. Let's get down to business. 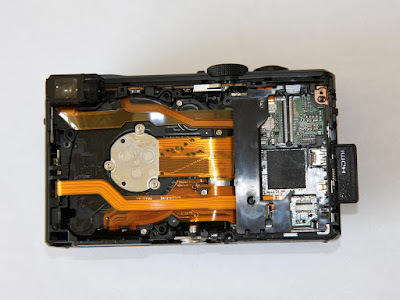 Remove the lanyard, battery, and memory card from the camera. This is the easy part. Enjoy it while it lasts. Next, remove the seven screws holding the back on. There are four on the bottom, one on the left (when looking from the back), and two on the right. 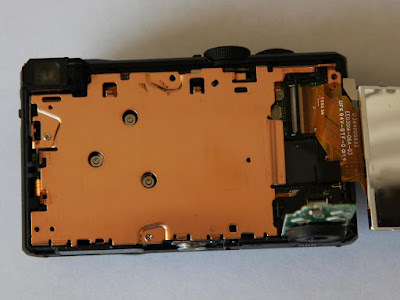 Panasonic uses a bit of Loctite to help keep the screws from coming out so be prepared for them not coming out easily. I wasn't, and I screwed up (ha ha) one of the screws on the bottom, probably because I didn't have a JIS screwdriver. I was fortunate though that it came out halfway. I was able grab the screw head with some pliers and turn it the rest of the way out. I was probably pretty lucky that this was the only one I messed up. As a friend of mine likes to say, I'd rather be lucky than good. Here is maybe a good time to say that there are a pile of screws holding this thing together, many of them different sizes. I suggest doing what I did. Get a piece of paper and draw a little picture of what it is you are about to take apart. Wrap some scotch tape in a loop so the sticky side faces out and stick that on the paper. As you remove each screw, place it on your picture so you know exactly where it goes. I'll warn you ahead of time that some assemblies will have two screws right next to each other of a different thread and / or length. If you think you'll just be able to remember, you're probably wrong. And this is an expensive camera to gamble on. How many screws hold this thing together? This many. Once the screws are out, the back cover will stay in place thanks to a set of plastic clips all around it. Unlike previous versions of the camera, nothing is attached to this cover. Carefully tug at the back cover and the clips should let go. Set the cover aside. Next, the circuit board with the control dial needs to be freed up. Push it down gently from the top to free it from the two plastic clips. It will slide down a bit and come loose. Fold it up and out of the way. Now the display has to come loose. 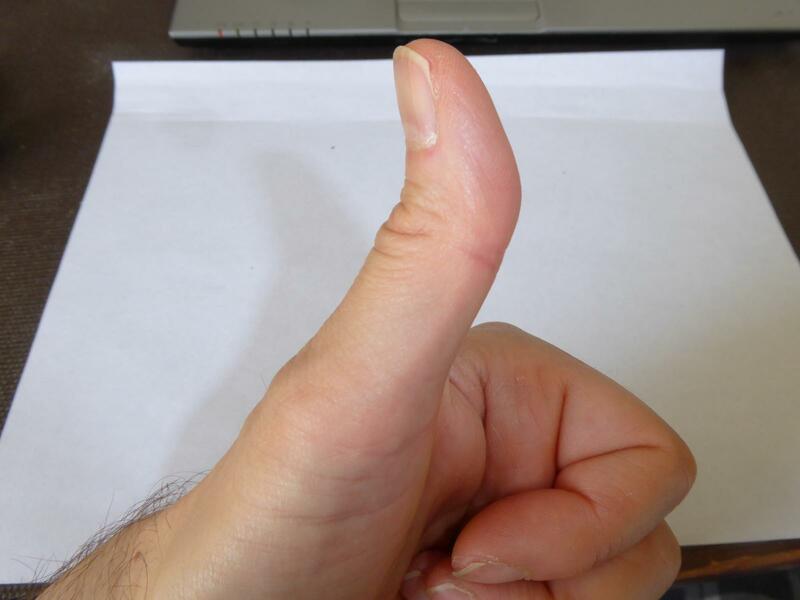 Put gentle pressure with your finger on the left edge of the display and push it to the right while you gently pull up on the right edge of the display. There is a thin piece of metal sticking out on that left edge. Pushing to the right will get that metal piece past two heavier metal clips holding the display down. The display will then fold over to the right. 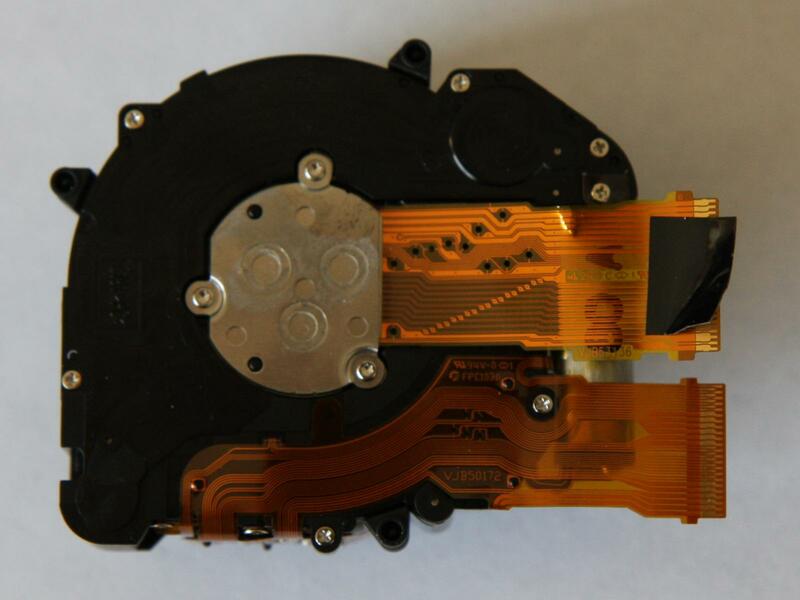 Remove the four screws holding the gold-colored frame plate down. BEWARE. These screws are different sizes, so keep track of which one went where. The screw at top right has a finer thread than the other three. Once you've removed the frame plate, you should see something like this. Removing that frame plate is a little tricky. 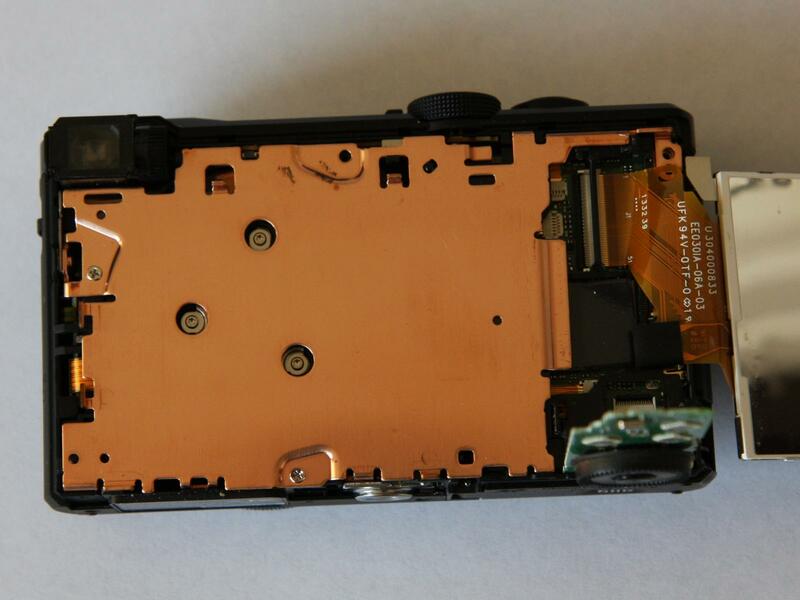 There is a long metal tab on the bottom left corner of this plate that extends deep into the body of the camera. Use a small bladed screwdriver in this corner and lift up from there. The right side of the frame is going to try and stay in place as you do so. 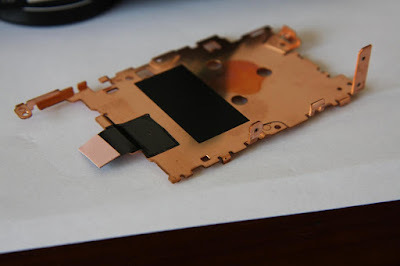 This is because the frame plate acts as a heat sink for the camera's image processor. There is a sticky thermal pad under the black tape on the right side of the frame. As you pull up from the left, the sticky pad should pull away from the processor on the right. Set the frame aside once it comes free. Don't let the sticky pad touch anything because you'll want it to stick on to the processor again when you replace the frame. I covered the frame up with a small piece of Tupperware to prevent any dust in the room from landing on it. This picture is the frame plate after removal. The sticky heat sink stuff is that beige rectangle on the left. You can also see that long metal tab I was talking about on the right. Now the control board and the display can be removed. Use a small flat-bladed screwdriver to lift up on the black tab on the rear of the connectors, opposite to where the ribbon cable enters the connector. The black tab will flip up. This black tab is the clamp that holds the ribbon cable in place. 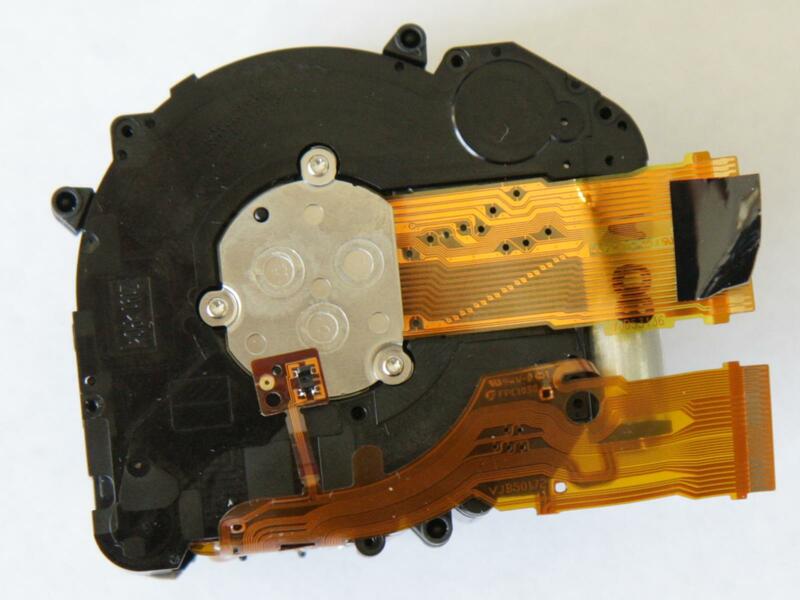 Gently pull the ribbon cable out of its socket. Note just how far that ribbon cable goes in there. 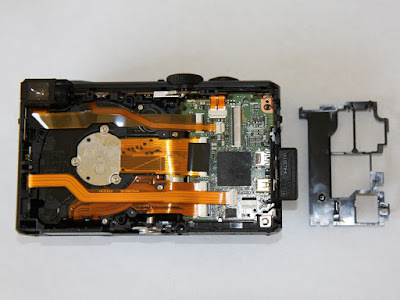 It will be important when re-assembling the camera to make sure these ribbon cables are pushed all the way back in, and that they are nice and straight with respect to the connector. If the cable goes in crooked, it won't push in far enough and there will be the chance of a short-circuit. This is what you'll see once the control board and display are removed. 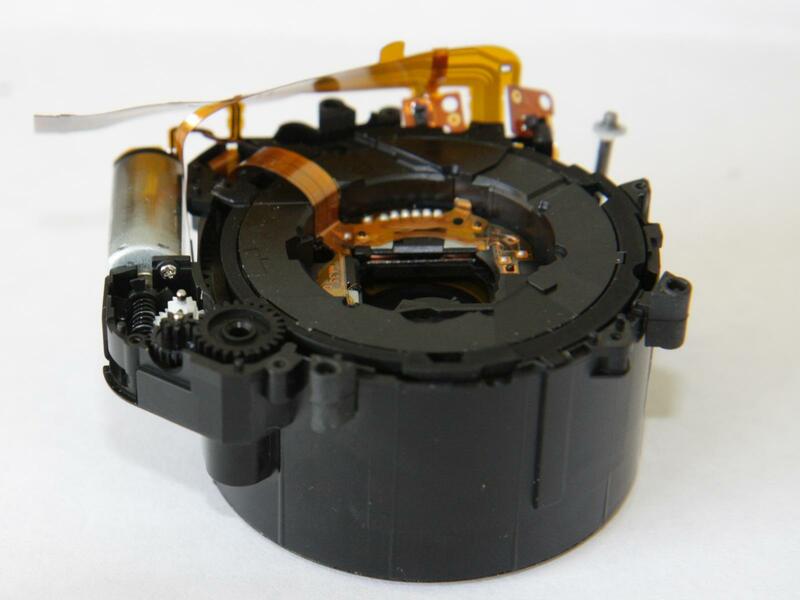 There is a black plastic thingamahooie between the lens assembly and the main circuit board. Wiggle it around a bit and it should come loose. Set the thingamahooie aside. There are three ribbon cables crossing over the lens assembly and another two on the assembly itself. 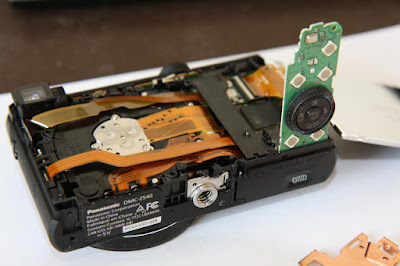 Remove them from the connectors on the circuit board at the right of the camera by lifting up on the connector tabs as before with a small flat-bladed screwdriver. 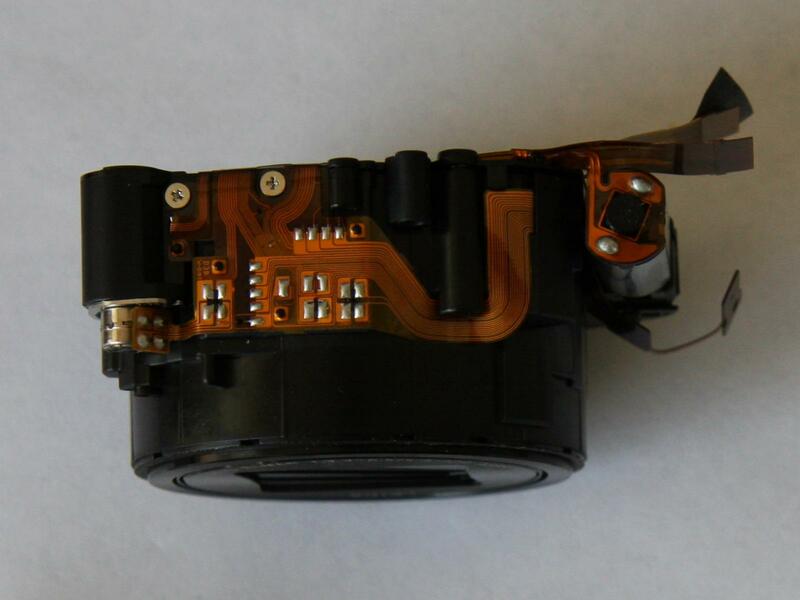 Note that there is some tape on the fat cable going to the middle of the lens assembly. You'll have to loosen this off before this cable can be removed. Once all of these cables have been removed, there is nothing else holding the lens assembly in place. 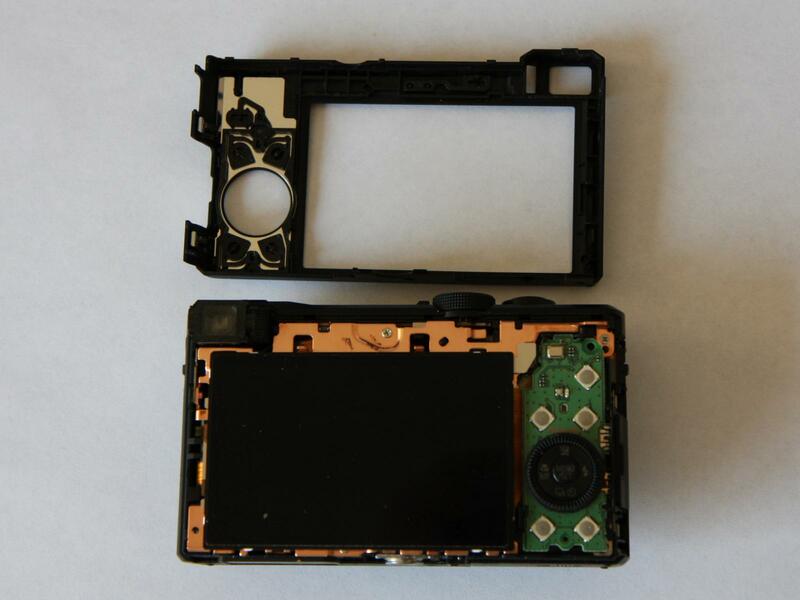 Gently pull up on the assembly to remove it from the main body of the camera, and set the body aside. Now things get really tricky. Take a deep breath and keep going. Above all, stay sober. Alcohol at this point won't make things go any smoother. Patience is a virtue. Wait for it. Face the front of the lens towards you and remove the small screw near the top of the zoom motor close to the lens. There is another one at the bottom right holding down the focus motor (said screw is not visible in the picture below). Remove it too. This second one will be much longer than the first. 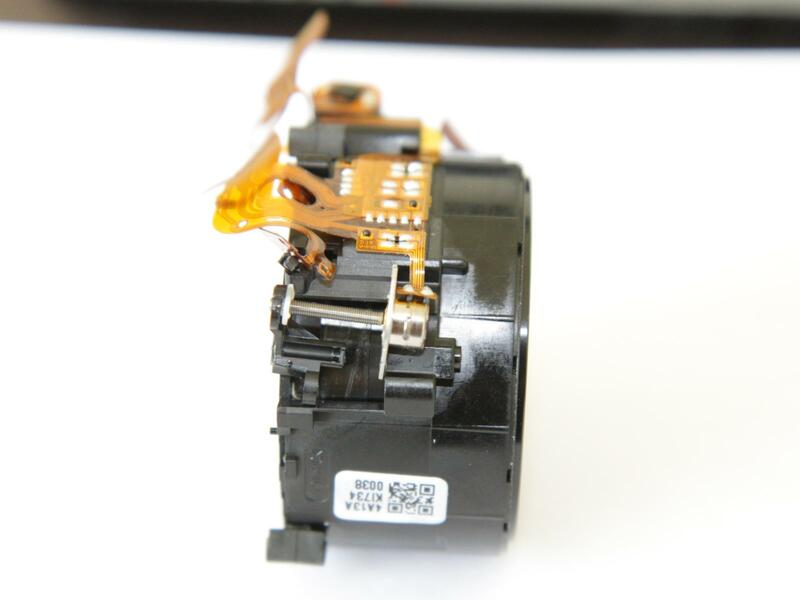 If you look at the bottom of the zoom motor, you'll see that the ribbon cable is soldered in place. I was really worried for a while that I'd have to unsolder the thing to proceed with the disassembly. Fear not. You don't need to. You'll have a lot of other things to be fearful of in a minute, though. Turn the lens to face down. Remove the seven screws around the outside edge of the lens assembly. Keep track of which one went where! The screw holding down the ribbon cable is smaller than the rest. DON'T remove the CCD which is attached on the other side of the silver disk in the middle of the rear of the lens assembly with three weird screws. 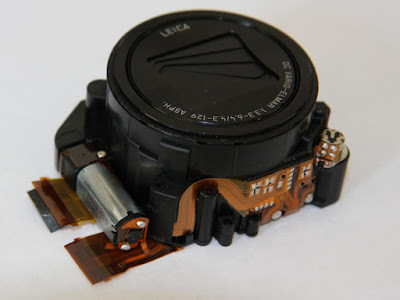 The CCD (or image sensor as it is otherwise known) isn't necessary to get at the focus or zoom motors. I would recommend NOT removing the CCD unless you absolutely have to. I get the feeling that taking it off could throw things out of alignment and result in crappy pictures later. That is more a theory than a fact, but don't risk it if you don't have to. Turn the lens so the bottom faces toward you. There are two screws to remove here at the top left. Pry the ribbon cable off all of the little black posts on the rear of the assembly with a small flat-bladed screwdriver. The cable will pop free from the post with a bit of pressure. Be REALLY careful here - you really don't want to damage these cables. 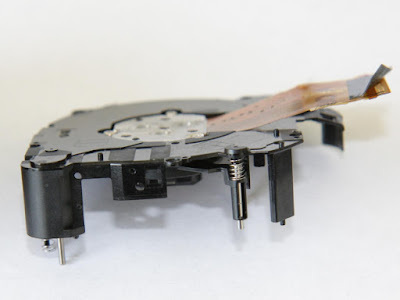 Next you will see a connected piece of cable that is folded over and deviously connected to a black plastic tab helping to keep the bottom of the back cover of the lens assembly from coming free (I got stuck here for the longest time before I figured this out). You also have to pop the ribbon cable off the little black post on the very left side of the bottom of the lens. 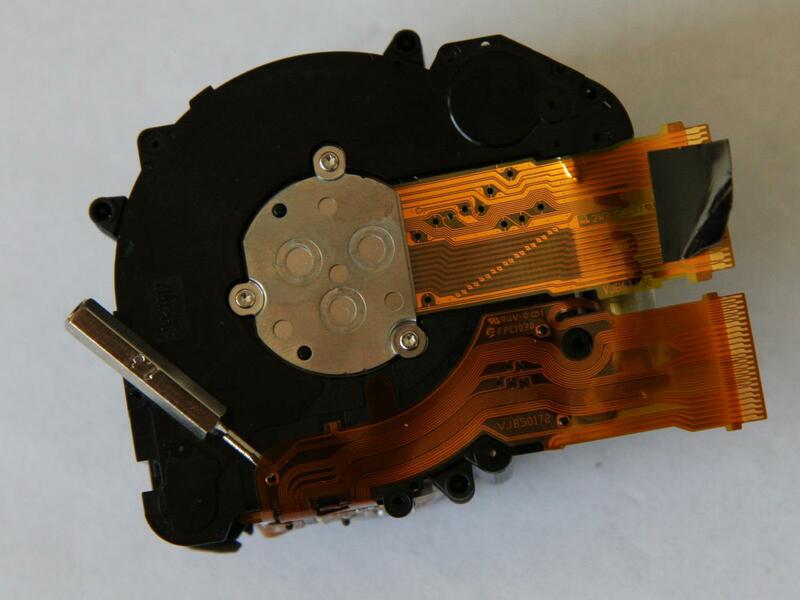 The picture below shows the devious little tab popped out and laying over top of the back of the silver disk. There is another one like it to its left that has to come out too. Once that is off, the back of the lens assembly should pull away cleanly. Put this someplace clean where dust can't get at it. I again covered it with a piece of Tupperware. Here is another look at the rear of the lens assembly, this time from the side. If you look carefully, you can kind of see the hole where that devious little clip fits into. Now we can take a look at the motors. This is the zoom motor on the left. If you were getting a "System Error (Zoom)" message, you want to be looking here. It seems that grit can work its way into the lens and cause this part to lock up. Mine still looks pretty good here. 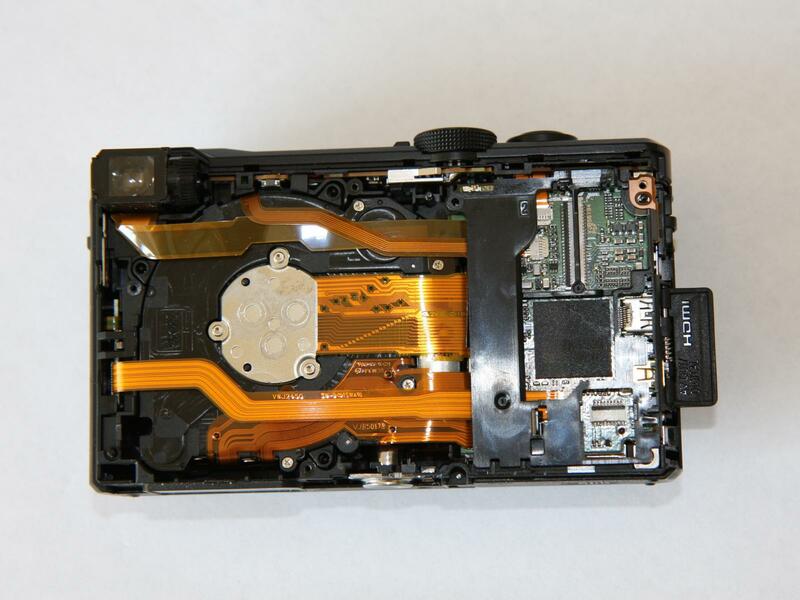 Pay particular attention to the screw holding the zoom motor in place that is only accessible AFTER the rear of the lens assembly has been removed. 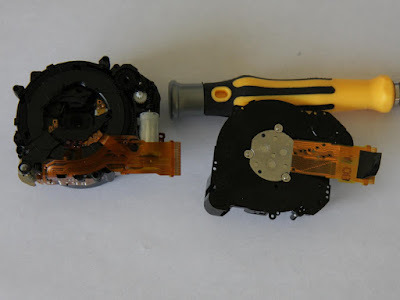 Other teardowns of older cameras have you pulling the zoom motor fairly early on in the disassembly process. That screw makes doing so impossible on this camera. This is the focus motor. The lug at the end of the thread pushes a little lens assembly up and down. Take this little assembly off and put it under a chunk of Tupperware. Nothing is holding this assembly in place, and it is bound to fall out as you look around the lens to figure out what is wrong with the damn thing. Now I was getting a "System Error (Focus)" message so I figured my problem was somewhere around this focus motor.. But the real problem was I couldn't see anything wrong with it. The drive was clean, greased, and the lug on it moved easily on the thread. This was kind of depressing. I had gone this far and found nothing. I thought maybe that the lug was a little too far near the end of its travel so I spun it back down the thread a bit. But really, I thought the motor was probably fried and there wasn't much I could do. So, I just started putting the thing back together. Assembly is the reverse of disassembly (just read this post backwards and you should be good). I was really worried that reassembly would be the hardest part of it, but it went back together easily. I was glad I had taken a lot of pictures along the way and that I had been pretty meticulous in keeping track of which screw went where. With everything back together, I put the battery back in and powered on the camera. I hadn't fixed anything, so I wasn't expecting anything. It asked me to enter the time and date. That's weird. I can see how it could have lost this information with how I'd taken everything apart, but it wasn't giving me an error message. So I entered the time and date. And it worked. So I used the now working camera to take a picture. And the thing is, I have no good idea why it works now. Maybe threading that lug on the focus motor a little further down did the trick. Maybe one of the ribbon cables had worked loose a bit, and the reassembly straightened things out. Don't know, don't care. Because it worked. 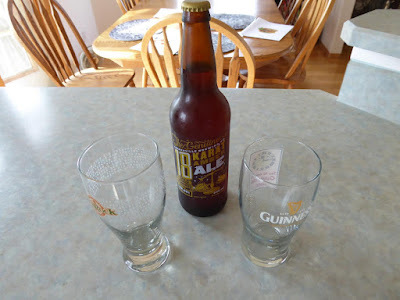 Time to celebrate with a little something a kind relative dropped off the other day on her way through town. And I took a picture of it too. Because I have a camera that works. See you next time, here at Mad Scientist Labs. Awesome, enjoy that well deserved ale!!! Sometimes just disassembly and reassembly fixes everything, happens a lot in cars. I have the same camera and dust in the lens but no way I'm going through this to clean it, I can live with it. Really good! My camera has been swimming, so I might have to go through all this as well. I'm also a computer fundi! Ive taken mine apart (several different models) many times. Those 2 "clips" as you call them are sensors that look for zoom (sensor on the right) and focus (sensor on the left near focus motor). If sensor screws are loose, they can be jared out of alignment and give your zoom and focus errors. On reassembly, I make sure those sensors stradle the plastic lip they sense and then tighten down snug. I have torn the ribbon before too and had to tape the tear so it wouldnt get worse and soldered wire wrap wire on scraped spots to jumper the tear. I have also disasembled the lens pack to clean out dust. Dust gets in and the pics look spotty if you go thru all this and dont clean out the dust. Its not hard to take the lens apart and reassemble if you mark on paper the orientation of each part as you get it to come apart. Those people that dont make drawings as you go are the people that get in trouble. Below zs40, there are actually little triangles to line up at each stage. ZS40 on up is actually easier to disassemble and doesnt have triagles. 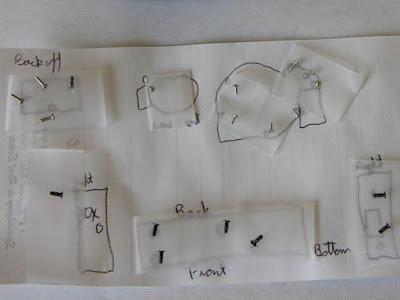 But you should make drawings as you go so you have no doubts on re-assembly. Oh, and if your camera went into water, its a total loss. The ribbon cables turn green and short out everywhere. I had a zs40 fall onto the wet beach. It stuck into the sand on only the end where the eye viewer is. The camera still worked and I dried it off. But it wouldnt focus and take pics. I tore it apart and the GPS was all green and shorted out. Its on the eye viewer side. The eye viewer only showed red colors. That ribbon cable was also green and all shorted out. And the focus motor was all rusty and locked up and the wiring inside the tiny motor was hopelessly green and rotten. Amazing how that little drop on just a wet beach got just enough water inside to pretty much total the camera, even though it didnt actually fall into the water. I was amazed that water got into that motor and toasted it. So total immersion is just completely hopeless. The power in the battery imediately starts to tear every wet thing inside it. And even if it didnt have a battery inside, you get contaminated dirty water inside the lenses in the lens pack. And you cant clean in between the multi lenses. Thats why you dont use spray cleaner in the lens pack either. If it gets in between the preassembles lens groups, you cant get the cleaner out and its dries dingy and messes up any pics. I am so glad to find this page and very impressed! Suffice it to say I'm not even going to try this myself. Can anyone please recommend someplace where I can take my camera to for repairs? I bought this camera not that long ago and it was frustrating when this problem cropped up last month. I was in Africa and did not bother to try getting it repaired there. Many thanks! I followed your instructions and I'm now where I need to remove the seven screws around the outside edge of the lens assembly. Some of these screws are very tight and I'm having difficulty removing them. I'm using a #00 Philips screwdriver and the screwdriver is slipping. I don't want to strip the screws. Does this mean I need to find a JIS screwdriver? If so, are there any stores that sell them or do I have to order one from eBay? What size? #000? #00? or #0? Thanks for the how to: I had two dead ZS40's and your guide allowed me to swap modules and get one working ZS40. Will now look for parts on ebay to restore the dead ZS40. Thanks a million!!! Thanks for the inspiration - for what it's worth here is my experience... I dropped my TZ70 about a year ago onto a road. It has been working fine until this morning when I got the System Error (Focus) message and couldn't start the camera up. Reading through your post I wondered if it might be just something a bit loose or out of position inside. So, thinking "nothing to lose", I banged the camera on my table a few times in a few different directions, after which it powered up fine!!! Don't know how long this will last, but thought it worth mentioning. Thank you sooooo much!!! My Lumix DMC-FS35 had the system error zoom message too after dropping it. After much research and fiddling I came across this thread and your message, gently pressed my camera lens down on the table and it popped in and is now working! Same as you not sure for how long but thanks again for posting that! So. I took it apart. Very little down side to it; it didn't work before and professional repairs were too high. I THINK I've got it all back together to a point (but also have questions whether I put the 2 plastic lens things back together correctly, they popped off of the back of the lens assembly when I pulled it off ... but anyway ...). However, I am at the point where I just assembled the front and back lens assembly. But I have this ribbon cable piece staring at me, and I have no idea where it goes. 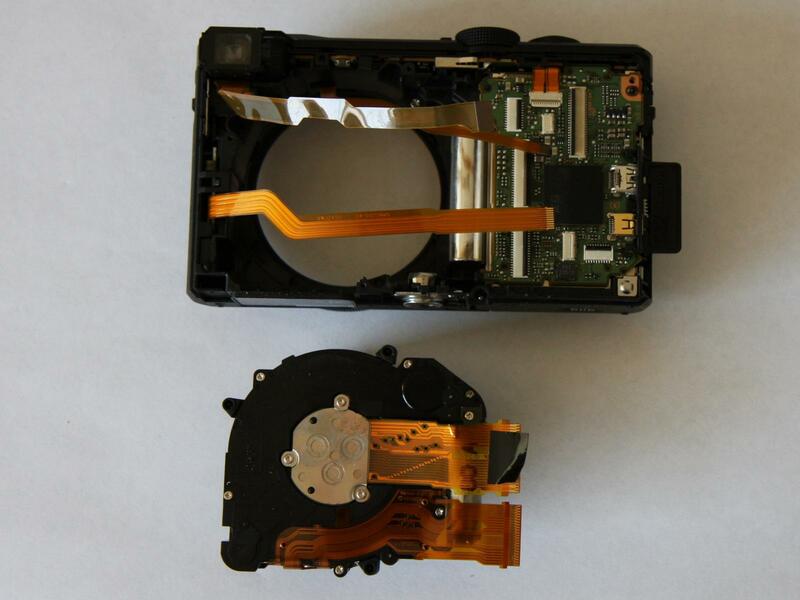 In your pics, right before you show the two pieces of the lens assembly apart, you show a small square ribbon piece hovering over the silver middle lens thing that you said was the CCD. Where does that ribbon connector end (squar-ish thing) go? Please?? I had a rock in my TZ60 lens that stopped it from zooming. I have taken the camera apart and including stripping the lens right down. I have it together now but only one problem, it will not focus. What am I looking for here to fix it? V useful tutorial. I have dust on my CCD/sensor and stripped down so that I could see the back plate of the CCD and found 3 torex head screws that stopped me dead - no torex head sufficiently small. If I had removed the screws could I have cleaned the CCD without taking the lens out? If so anyone know the size of the torex? On my TZ70, the CCD sensor plate is held in by three Torx T3's. (Torx drivers available quite cheap on Ebay). There are three small springs under the plate, don't lose them. Yes the plate will lift out without removing the lens assembly. 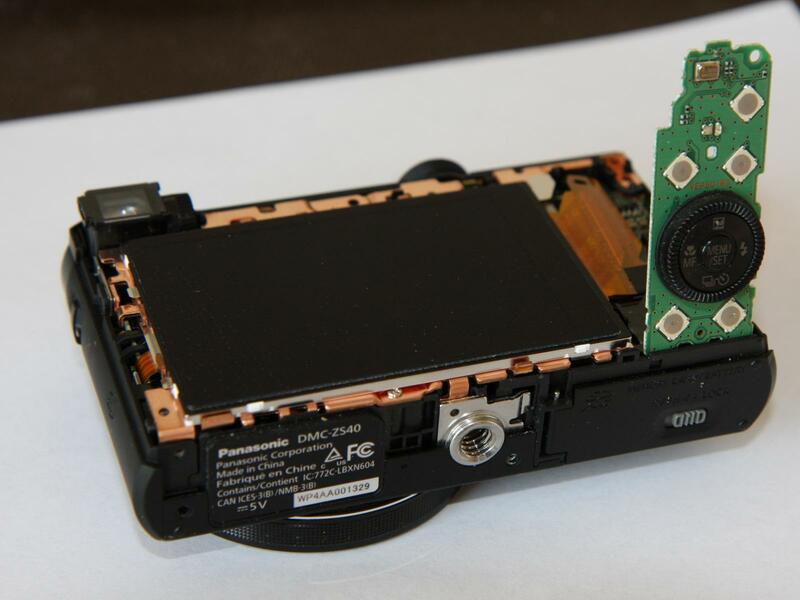 You can clean the sensor like this, yes. I bought a set of tiny TORX off eBay and did it. I have a solution for mechanical focus problems which may be the same issue with other Panasonic models - seems common. I have a TZ70. A couple of weeks ago I found that the focus was hunting at anything near 30x zoom or beyond and if it did lock on and confirm focus it was actually out of focus. It got worse up close too but I did not have any error messages. I followed a service manual I downloaded for a TZ60 and in conjunction with this and other pages and videos for a reasonable understanding before I started. 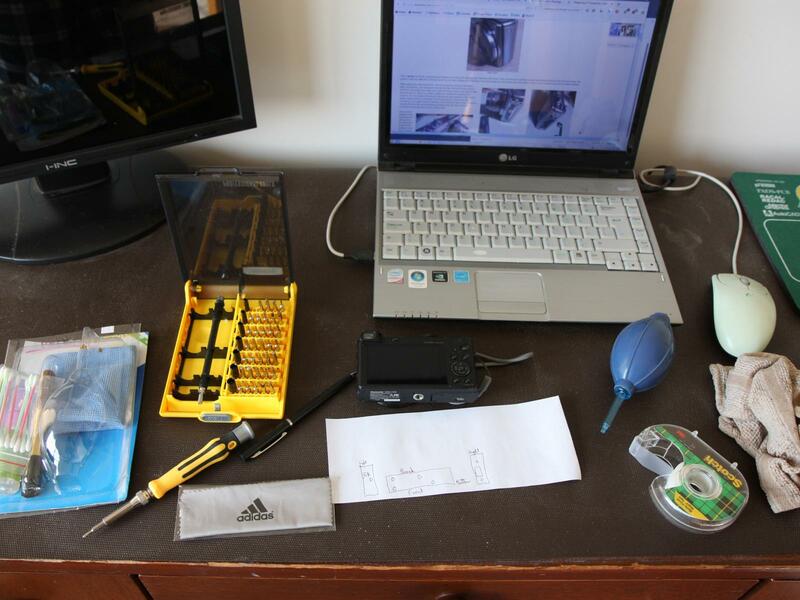 It took me 5 hours to pull apart and put back together, taking photos and making notes as I went. Most of this mucking around with the focus lenses and slides, and reassembling with the tangle of flex cables!! I did not pull the lens fully apart as there was no problem with the zoom. On turning on when reassembled I found error message, lens not operating properly, but each time I turned off and on it got a bit better. The focus problem was fixed, but the lens extending and zooming was making a noise which sounded like a gear issue. I had not touched the gears so was not sure if something was bumped out of alignment or something damaged electrically. Having spent the best part of a day I decided I may as well spend the rest of the day pulling apart again and checking. It took me 45 minutes this time and I and found I did not need to remove as much, and discovered an easier way to deal with some things. This time it was working perfectly when reassembled , no error messages, zoom quite. Now for how I fixed the focus. (My TZ70 may be a little different to the TZ60, you have no exploded view of the focus lens assembly in the upper lens cover (master flange). The two focus lenses float up and down, pushed up by springs, adjusted down by the worm drive with lug on the end from the focus motor. I removed motor from flange with the the worm drive (screw secures) which looked clean with sufficient grease on the thread, but once removed I was able to push down on the focus lens locating brackets on slides against the springs and found that unless pushed down evenly the plastic sleeves which slide up and down the metal pin shafts (springs on shafts under bracket sleeves) bind sometimes instead of sliding. I guessed this may have been the problem so lubricated all metal shafts so the plastic sleeves slide easily. I could not get any thin grease from a few places I tried so used some rubber grease (used on brake cylinders), it had started to separate inside the cap so took the almost liquid portion with thin consistency, and ok on rubber and plastics. Be careful not to let the lug on the worm drive thread spin up or down a few threads as this would probably affect focus adjustment. As you did this DeKay this is probably the reason you have some out of focus shots afterwards. I was concerned as mine had rotated a little, however comparing AF shots with manual focus shots (zoom and close), the AF was spot on. I figured I may as well pass on my experience with fixing the AF, as others had taken the time to write up or do videos on the dismantling which helped me. I had not found any detail on how the focus lenses move on the slides, so this will be the first.